Seat Size 14" 15" 16"
in hard to find sizes!!! Child's Size 14", 15", 16"
Tree Widths: Standard (a generous regular/medium width), and Wide. 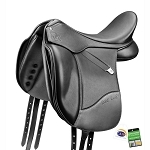 The "Shannon" Junior Dressage saddle features rich black grained cowhide with smooth leather knee pads. 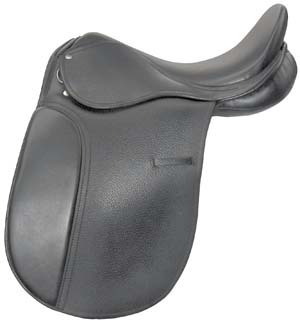 Comfortable semi-deep seat, long dressage billets and stuffed panels. An excellent choice for children learning dressage. Nicely balanced design allows child to learn proper positioning. 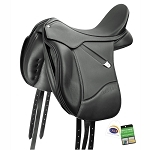 This saddle is by Thornhill right here in Pennsylvania! "SHANNON" of Thornhill is made to Thornhill's specifications by Pakistani Saddlers with over 50 years commercial experience. The "Shannon" dressage saddle is the only reasonably priced children's dressage saddle in tree widths to fit most ponies and horses! We looked high and wide and cannot beat the serviceability and value offered by the Shannon. Great for Pony Club Dressage Rally!!! "As well as being a retailer, my children and I have been riding and showing exclusively in Thornhill saddles for the last 16 years, and I love the superb quality, craftsmanship, and balanced design that these saddles offer. 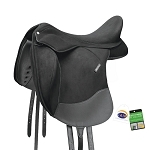 This particular model is a great economical, entry level dressage saddle for children to allow them the proper balance and position to learn their dressage foundation."